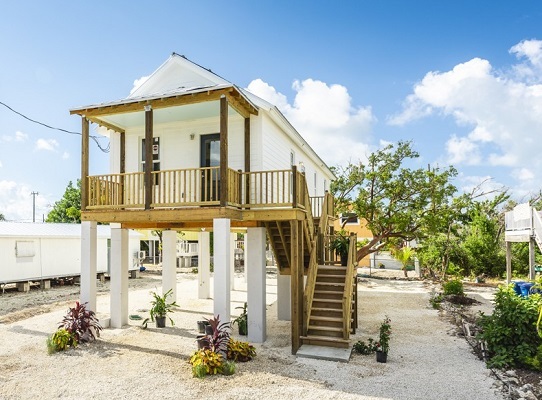 After the destruction of Hurricane Irma, the Florida Keys Community Land Trust started building affordable cottages that can withstand the next storm. Like other tourist destinations, the Keys — a string of islands off the southern tip of Florida — require workers to staff their restaurants, hotels, and glass-bottom boats. Read the entire article at CityLab. When Hurricane Irma struck the Keys in September 2017, it exacerbated an already pressing need for affordable housing. Much of the cheaper housing on Big Pine Key comprised trailers at ground level and older buildings that couldn’t withstand the storm surge and 120 mile-per-hour winds. “The affordable housing was extremely vulnerable, so when the storm surge came in, the houses that were housing a lot of the workforce were destroyed,” said designer Marianne Cusato. According to Monroe County data, Irma destroyed 473 homes on Big Pine Key — the most of any Key — and damaged 1,538. Three months after the storm hit, the Miami Herald reported that some Big Pine Key residents were still living in tents. The Florida Keys Community Land Trust was founded in 2017 with the goal of “preserving and enhancing the way of life for the workforce of Monroe County, Florida.” Community land trusts are non-profit entities that steward land and develop and manage affordable housing. On lots that Monroe County purchased and will lease back to the trust for 99 years, the trust is building four new cottages that are engineered to withstand 200 mile-per-hour winds and are elevated 12 feet — one foot above the required base flood elevation. The initial four cottages, built for $199,000 each (through a mix of public and nonprofit funding), measure 760 square feet and have two bedrooms and one bath. Monthly rent will be capped at $1,588 (80 percent of area median income) and will likely be lower for many families, Laurent said, depending on their income. To qualify for a cottage, 70 percent of a household’s income must be earned in Monroe County. More than 100 people have already pre-applied to move in, and the land trust will give preference to families displaced by Irma. It hasn’t yet selected the first residents, but Laurent hopes they will move in by mid-September.